A friend of mine linked this article about the changes to various plant foods after domestication a couple days ago. I fund the ways we’ve selectively bred crops to be fascinating — particularly the way teosinte has made such utterly radical changes. Our changes to animals have been large, but in the cases of livestock those changes haven’t been nearly as radical as what teosinte underwent, at least not physically. When we domesticate animals, the changes tend to be mostly mental: they have a much shorter flight distance and a much larger tolerance for novelty than their wild counterparts. Dogs, of course, are the canonical case of domestication that wrought large physiological changes but even larger mental ones. On the basis of pure physicality my German Shepherds are recognizable as cousins to the wolf; Zille even carries the agouti striping on each hair that gives wolves their camouflage. But mentally they are worlds away from their wild cousins, who would rather eat sheep than herd them and would never dream of being a service animal. 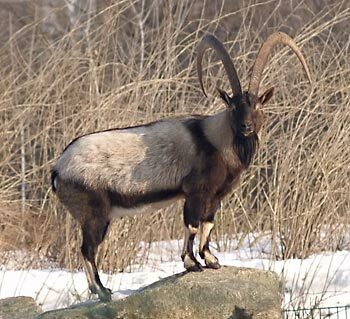 The bezoar ibex (Capra aegagrus aegagrus) is, if not the only ancestor of domesticated goats (Capra aegagrus hircus), then certainly the majority ancestor. Looking at it, it is recognizably a goat, and the “bezoar” color pattern of a lighter body with black markings on legs, belly, and face along with a black dorsal stripe persists in our friendly dairy goats. 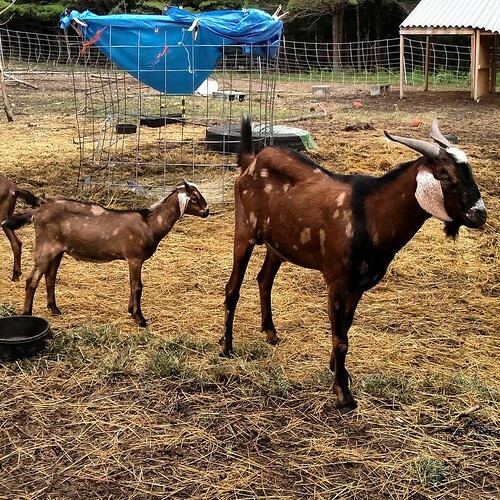 Sebastian shows off the adult bezoar pattern in domesticated goats while Terror shows off the juvenile version. If I had Alpines instead of Nubian/Spanish crosses, the physical resemblance would be even more striking, since Alpines have retained the upright ears of most goat breeds. Physiologically and skeletally, however, the ancestors of domestic goats and my goats are indistinguishable aside from matters of size (and those magnificent horns!). In chickens the wild type has been retained as a modern breed, referred to as “Jungle Fowl”, and game breeds originally bred for fighting adhere to it quite closely except in matters of color of tameness. Most domesticated breeds of chicken have had their ability to sit a nest and raise young bred out of them by the advent of incubators and brooders, something that’s been quite the problem for us in establishing a self-replacing free-range flock. Sheep haven’t had the wild type preserved in domestication, not even by beloved Soays. Though they’re closer to the wild mouflon in size, appearance, and shedding than other breeds, they’re still recognizably touched by selective breeding. But they’re still closer visually and physiologically to their ancestors than teosinte and corn. Indeed, we may have to go back to dogs and turn to the Chihuahua to find an animal that’s come as far from its ancestors as corn has. The plasticity of plant genomes appears to out-perform that of mammals at least in terms of non-lethal mutations useful to humans. At any rate, the story of human-guided evolution remains fascinating. Unfortunately the wild equivalents of much of our livestock are in danger of disappearing (the aurochs is already gone). Without care and conservation, our grandchildren may no longer be able to look and see where goats came from.